Now that Baby Zee is 6 months and slowly staring to get on the move, Dave and I have been talking about re-visiting and re-assessing all of the baby-proofing measures we have in place. 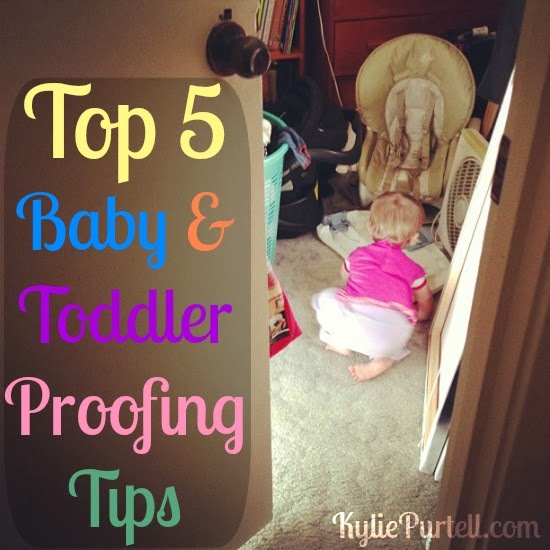 I wrote a post about our efforts at baby-proofing when Punky was about 9 months old. She started crawling around the house at 6 months and by 9 months was well and truly cruising around the furniture. This meant that she was able to gain access to a whole lot of places she couldn't when she was less mobile, and after a few close calls it was time to spring in to action. In the 18 months or so that Punky has been mobile we have learnt a few lessons about not just baby-proofing, but toddler-proofing as well, and I thought it was time to share that knowledge with you! While some rooms of the house are not easy to baby-proof, it pays to get in to the habit of keeping doors to those rooms closed at all times, or install gates to keep the kids out. That way you can just concentrate on baby-proofing those areas of the home that you're happy for your kids to explore. The very first thing I did once Punky started crawling was to move all of our cleaning products and other household chemicals to a few places around the house that we could secure and know that Punky could not get to them. I have all of the washing detergents and outdoor chemicals like bug spray and weed killers on a really high shelf in our garage. There is no way Punky or Zee will be able to get to those without first growing a lot of muscle to be able to move, open and position the big ladder we have. 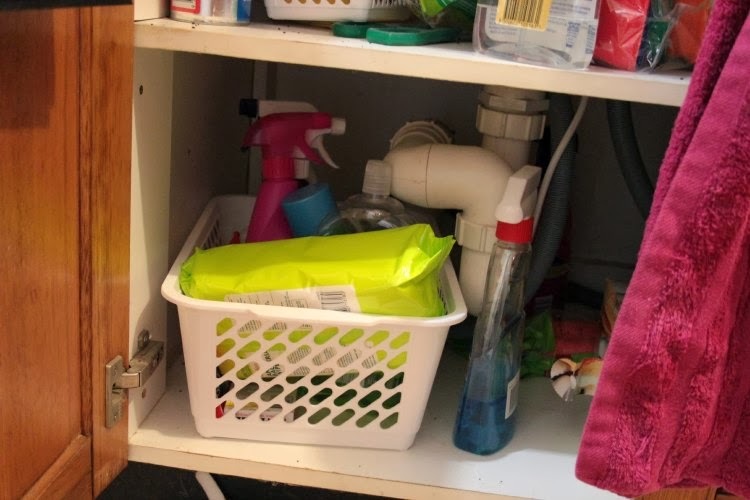 Indoor cleaning products and bug sprays were all moved to a basket and shelf under the sink. We then used child-proof latches on the doors so that little people are unable to open them more than an inch or so.The beauty of the latches we used from Safety1st is that they are easy to install and easy for adults to figure out, but not so easy for kids. Even after watching us many times Punky still can't figure it out! They are also cheap to buy and we bought ours from our local Target. We live on a main road with a 70km/h speed limit, so we knew it was a priority to have a door that Punky could not open herself. So off to Bunnings we went and picked ourselves up a new one for around $100. The hard part was installing it, but thankfully my step-Dad is a very handy Man, and with a little guidance Dave had that door installed in no time! 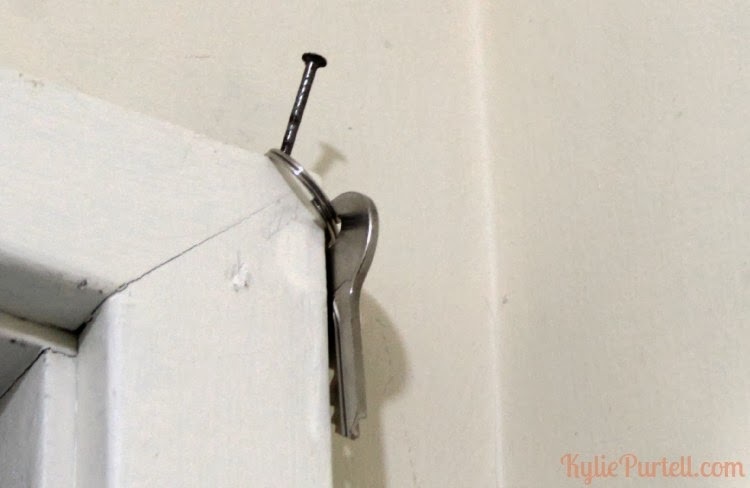 We have a small nail hammered in to the top of the door frame that we hang the key from. It's un-noticeable unless you know it's there, and it's high enough that even a small child on a chair can't reach it. when I went a bit nuts and covered the house in them, inside and out! There are some things that kids need to learn they are not to touch and that are out of bounds. But babies don't have the smarts to learn that straight away, and toddlers lack the impulse control to stop themselves even when they know they shouldn't. So I re-arranged some of the cupboards in the kitchen to make kid-friendly items low and within reach. Things like Tupperware and safe utensils. This way there were cupboards and drawers that curious hands could explore safely, and the rest we put latches on. 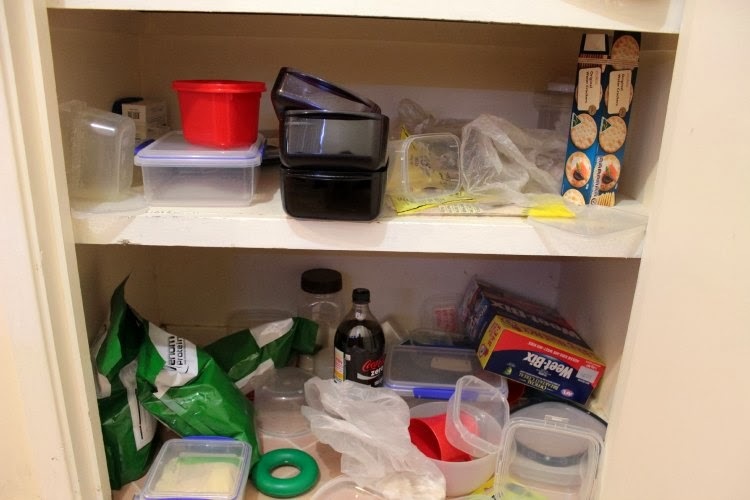 The bottom of my pantry could really do with a bit of a tidy, as you can see even now Punky enjoys rummaging around and playing in there. I'm often finding random toys stashed away! Please excuse the plastic bag with the garlic, It fell off the shelf when I opened the cupboard, then got distracted, then forgot to pick it up before I snapped the pic! 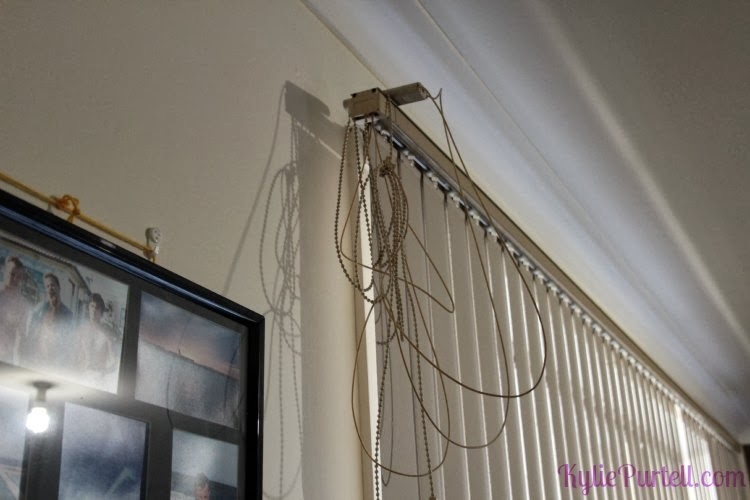 I've tied our cords in a loose knot and hung them over the top blind rail (I need to stand on tiptoes or get a chair to reach them) and there are a few that have been looped over hooks. At my Mum's place we have a gate at the top of the internal stairs, so that once we are inside, there is no way that one of the girls can accidentally fall down the stairs. We also have one at the top of the outside stairs that lead down to the backyard. A small inconvenience for an adult, but big peace of mind for a parent. The gates my Mum has can also be taken off easily, so when we aren't visiting the gates are popped in the store-room and only the hinges are left on the wall. These can also be useful for keeping children out of an area in the home that isn't easily baby-proofed. Make sure any pool fences meet the safety regulations set out by your state (they differ across the country, you can see the regulations for NSW here.). The gate opening/closure on my Mum's pool is able to be locked with a key when the pool is not actively being used. While the girls aren't there all the time, the kids next door are constantly losing their ball over the fence and on occasion the ball has ended up in the pool. The beauty of the key means that the kids can't open the pool gate at all unless Mum is home because she keeps it locked with the key and there is nothing close by for them to use to climb over the fence. Do you have any other tips and tricks you've used or learnt when it comes to baby & toddler proofing your home? I was paid a small fee to write this post for Safety1st. When we first baby-proofed the house we used all Safety1st products that we bought with our own money which is why, when I was approached to work with them, I said yes, as their products were ones we already used and loved. Safety1st have a range of safety solutions for home and travel, and you can find them all on their website, and available for sale in places like Target and select baby stores. This is great. I have a 10 month old roaming around now (first child) so just trying to work out what I should do and what I can get away with. Good tip on the cleaning goods as I hadn't thought of that. These little critters get into everything. Thanks so much! Great tips and a good reminder of how vigilant we need to be particularly with chemicals, cords, stairs, doors, you name it. We have a coffee table with quite sharp edges and I keep meaning to get something to put on the corners of it. Thanks for the reminder. Agree with #4 wholeheartedly, just recently heard of a toddler's death from this. 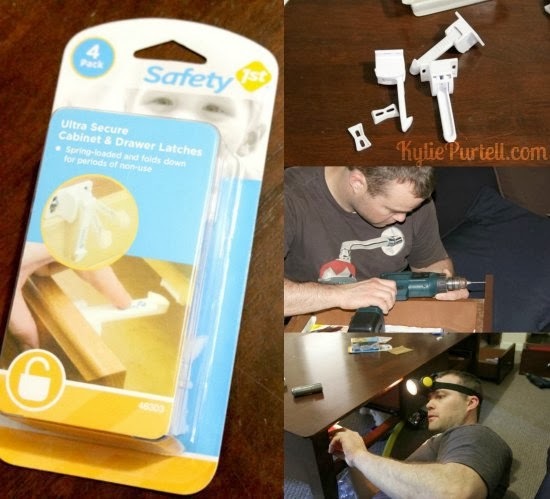 I had safety 1st stuff as well when I was baby proofing the house and I loved them. When Paul's kids were younger he turned the door handles on the screen doors upside down so that they were harder for the kids to open. The place that I live is government housing so it hasn't been taken care of very well before me and the locks have been ripped off..which makes it easy for me as it means once the doors are locked with the key, they are impossible to open. I live on a main road so this was really important. These are all good tips Kylie, especially about the blind cords, this one has always terrified me!! With a 10-year-old, we're long out of the toddler safety stage, but I remember doing all these things when Bell was little. Ahh the dreaded baby proofing - I can't wait til I can take the shiz off my under sink cupboard! Books. I've got a few.